Strong steel entry doors and ultra-resistant fiberglass doors, whose finish perfectly reproduces natural wood, but without the need for maintenance. In addition to beautifying your home, our durable front doors are are resistant to all weather conditions for a comfortable home. Featuring protection, durability and resistance to bumps and delamination. Available in single door, garden, and single door with side and transom. All our glass doors are tempered for better impact resistance; our double-sealed windows are one-inch thick for superior insulation. We offer a wide range of stained-glass windows that can be produced in different sizes. Choice of black, silver, stainless steel and tin grids. Opacity to suit your needs (visible to private). Variety of styles – classic, contemporary, modern. 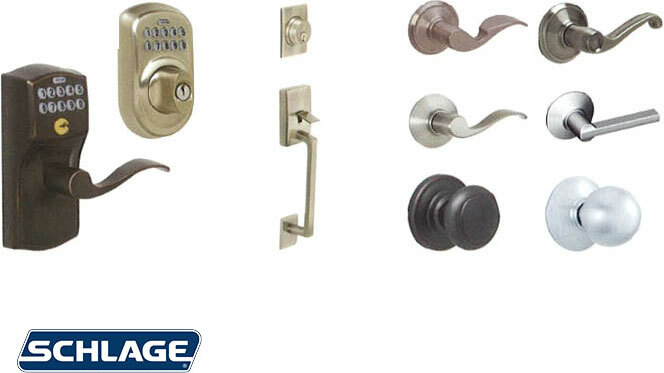 Welcome to the «Schlage experience» Schlage has built its reputation on offering the best in security for homes and businesses. Contact us for more choices, brochures and more.